There are many frames that can be used to try to understand the disaster that unravelled last week at the Mount Polley mine in central British Columbia when a dam holding in a tailings pond burst and spilled millions of litres of toxic sludge into creeks and lakes. My aim here is to make such an attempt using the metaphor of embedded, concentric circles that draw on broader and broader contexts of the spill. At the centre is the mine. 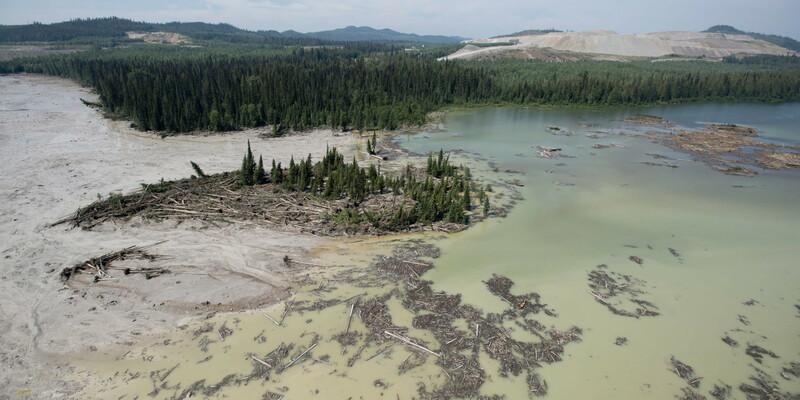 The very first reports and company statements claimed that the dam holding the tailings pond at Mount Polley mine was functioning correctly – that it was business as usual, interrupted by a freak accident. It has, however, quickly become clear that there is a history of significant negligence at the mine, specifically to do with the dam. Engineers, workers, a former foreman and government inspectors had all warned about small failures and violations that could easily lead to disaster. This week proved to be the proverbial last straw. While it may be of some cold comfort to know the failure was not inevitable, not business as usual, if we move out a bit further, it is also clear that the failure at the mine didn’t happen in a vacuum but was nestled in a circle of government regulation. The past decade has seen significant cuts to regulations, inspections and staff at the Ministries responsible for monitoring tailings ponds. In the two years after 2001, inspections dropped by over 50% and have grown only slightly since then; moreover, these were not isolated cuts but part of the general cuts to the public sector by the BC Liberals that have left BC with the smallest public sector in Canada. Finally there is the monetary “engagement” in the political process by Imperial Metals and its main stockholder. Mistakes happen. But if issues are foreseen but neglected, if there’s inadequate oversight and no contingency plan, how confident should British Columbians be that the province’s environment is being adequately protected? This mix of muted outrage and resignation admits that there are costs of doing (extractive) business in BC, but at the same time endows them with an aura of inevitability. Regular cheerleading for resource extraction on the one hand and regulatory cutbacks can at best lead to flabbergasted calls for temporarily (slightly) less extraction with (slightly) better rules. Going much farther out, the context for both the mine and the regulators is an economy predicated on amassing private wealth and private control of production and economic decision-making. In this sense, the Mount Polley disaster is not a particular conflagration of lax regulation and a booming extraction industry, but truly part of “business as usual” — the chase for profit that will try to skirt rules and cut corners wherever possible. Here, the corners were those shoring up a pool of toxic tailings at close range to important watersheds. But between this farthest circle of generality and the innermost circle of a bad apple in a barrel of regulatory failure are two other circles that have received less attention in the public debate around Mount Polley. First is the specific context of resource extraction as a tool of economic development, in Canada and British Columbia in particular. Extractive industries such as mining actually make up a tiny (roughly 1 per cent) slice of economic output. Yet despite their small relative size, clearly extractive industries have outsize importance. One challenge is to try to understand why this is so; even greater is that of asking whether this should be the case and what institutional change would be required to jump onto a different development path. Second, besides being embedded in a particular context of extraction, Mount Polley is also deeply embedded within a sad economic history of interactions with First Nations lands and communities. Two more questions to add to the previous two on industrial strategy: Could a new way of thinking about economic development be at once an attempt to decolonize the economy? What would an indigenized model of development look like for lands that are unceded or bound by treaties? The disaster has brought out the double bind of First Nations communities on the front lines of the extractive push. A few have managed to sign revenue-sharing agreements, which can be good when they actually provide significant resources directly to communities that not even 50 years ago faced state-sanctioned extinction. At the same time, such agreements are a short-term fix that link additional resources to extraction. In the worst case, they can leave communities such as the Williams Lake Indian Band, which shares revenues from Mount Polley, with pennies (around $4500 in the first year to be precise) and a scarred landscape. The cleanup of the spill, likely to cost well into the hundreds of millions of dollars, will add to GDP, which is a measure of all economic activity, while the shuttered salmon fisheries, already stopped on account of sick salmon, are a pure loss. For now, local workers can at best count on a job clearing toxic sludge. The economy is about trade-offs, but which trade-offs we focus on brings to light how development is structured and the choices people face. One choice is whether to mine at all: perhaps mining does make sense (copper could go into technology and other goods that can help people live better, work less and have more time off, but of course, that’s not our world), or perhaps the risks for mining low-grade ores like the ones found at Mount Polley are too great. But decisions about whether mining is worth it (or the decision to simply shore up a failing dam as output and profit expanded) would look very different if we took seriously not just long-term questions of development path and strategy, but also questions of what economic decolonization could mean as a response to the very different economic paths taken by various settler groups and First Nations. Mount Polley raises questions, and some surely don’t lead to the same resigned business as usual.